Famous for its mustard, Dijon has a rich gastronomic heritage as well as a fascinating history. Dijon was the former capital of the medieval duchy of Burgundy and is now the most important town in the Côte-d'Or, a beautiful region of green rolling hills. Dijon's ancient city center boasts many well-preserved buildings from the Ducal period. Especially noteworthy are the elegant mansions of the Dukes of Burgundy and other distinguished owners. Called "hôtels particuliers," these impressive houses are built on a grand scale with splendid facades. Visitors enjoy taking a stroll back in time through the old streets of Dijon and admiring the sights-from the Ducal Palace to the Fine Arts Museum and the medieval churches. Dijon is also a place to indulge in culinary delights and sample authentic specialties such as escargot and boeuf bourguignon, classic French cuisine that tourists love to experience. The Palais des Ducs is a must-see tourist attraction at the historic center of Dijon. The palace began as a very simple fortress built in the 3rd century to defend against Barbarian invasions. It was reconstructed beginning in 1366 by the first Duke of Valois, Philippe le Hardi. The main areas used for lodging were designed by the Lyonnaise architect Jean Poncelet and built between 1450 and 1455. The Tour de Bar (tower) is the oldest feature of the palace and reaches an impressive height of 52 meters. Facing the tower is the old palace kitchen, which is interesting to see because of its six grand fireplaces-allowing visitors to imagine the enormous banquets that were cooked here. From the platform of the Philippe le Bon tower (reached by climbing 316 steps) there is a splendid panoramic view of the city and surroundings. In the 17th century, the palace was enhanced by the architect Jules Hardouin-Mansart who created the Palace of Versailles. Updated in the Baroque style, the new palace incorporated parts of the earlier medieval structure. The renovations enhanced the building with attractive decorative details. In the east wing of the Palais des Ducs, the Musée des Beaux-Arts is one of the oldest and most important art museums in France. This Museum of Fine Arts boasts an encyclopedic collection of art-from Egyptian antiquities to the modern era. The ground floor documents the history of the building and displays medieval and Renaissance Burgundian sculptures. The first floor covers medieval Flemish, Swiss, and German paintings; 14th- to 18th-century Italian paintings; 16th- and 17th-century Flemish and Dutch paintings; 16th- to 20th-century French paintings; and 15th- to 20th-century sculpture. In the Salle des Gardes lie the tombs of the Dukes of Burgundy, "Philip the Bold" and "John the Fearless," as well as exquisite Gothic altarpieces from the Chartreuse de Champmol church. The Salle du Chapitre contains a few pieces from Sainte-Chapelle, the chapel of the Dukes of Burgundy. Just north of the Ducal Palace, the Eglise Notre-Dame is considered the "Grande Dame" of Dijon churches. This gorgeous place of worship was built between 1230 and 1250 in the Burgundian Gothic style. The splendid facade features a triple row of gargoyles presented as grotesque figures, and the church has a unique clock tower created in 1382 with charming jacquemarts, mechanical figures that chime the church bells. Originally there was only a single male figure, but in 1881 he was joined by a woman and two children. Inside the chapel on the right, is a precious 11th-century Black Virgin, one of the oldest pieces of wood sculpture in France. The church also contains a fine tapestry altar-cloth and a modern tapestry depicting the unsuccessful Siege of 1513 and the Liberation of 1944. Outside the church on an adjoining chapel is the sculpture of an owl, known as a good luck charm. Be sure to follow the Dijon tradition of touching the owl's left hand and then make a wish. 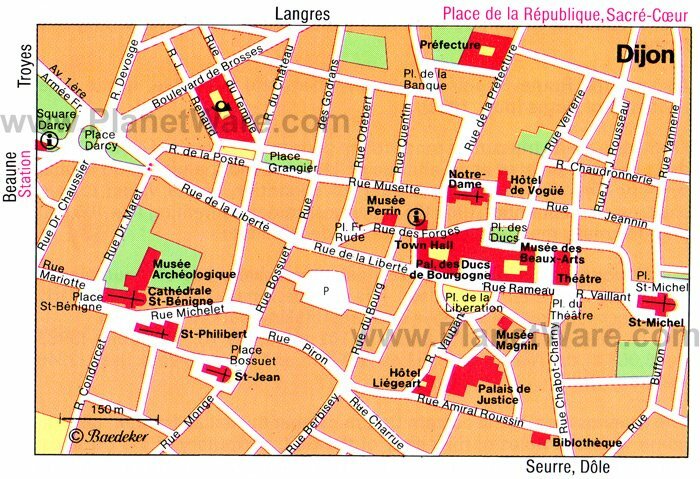 By continuing east from Notre-Dame, visitors will stumble upon the hôtels particuliers (lovely mansions) of the old Ducal Quarter on the Rue Verrerie, Rue Chaudronnerie, and Rue Vannerie, and especially on the Rue des Forges. In the cloister of the former Bernardine convent, the Musée de la Vie Bourguignonne gives visitors an appreciation of everyday life in Dijon from the 18th to the 20th century. The museum contains an interesting collection of both rural and urban Burgundian costumes, furniture, and household objects. The ground floor is devoted to Burgundian ethnic heritage at the end of the 19th century. The first floor focuses on the daily life in Dijon from the end of the 18th century to the Second World War, while the second floor features a gallery devoted to the characteristics of Burgundian life plus a reading room and an audiovisual room. Other attractions include a library and information center about the topics of 19th-century rural Burgundy, traditional crafts, and trades and industries of the region. The museum also offers guided visits, workshops, and a boutique. The Cathedral Saint-Bénigne is a monumental example of Burgundian Gothic architecture. The cathedral was built on the site of a Benedictine abbey constructed in the 6th century and dedicated to Saint Bénigne who was martyred around the end of the 2nd century. The abbey was later modified to accommodate the many pilgrims that arrived here and then destroyed by the fire of 1137 that devastated the entire city of Dijon. To replace the abbey, the cathedral was built between 1280 and 1314. The twin-towered building incorporates a Romanesque doorway and pre-Romanesque capitals from the earlier church. The only architectural structure of the original Romanesque abbey that remains is the large crypt, which contains the tomb of Saint Bénigne. The cathedral also houses an archaeological museum with an excellent collection of Roman and medieval antiquities. The Musée Magnin occupies the 17th-century Hôtel Lantin, one of the most beautiful hôtels particuliers in Dijon. The museum boasts a remarkable and extensive collection of paintings, designs and objects, primarily French works of art, which belonged to two passionate art collectors-Jeanne and Maurice Magnin. The collection of French paintings includes 650 pieces, most created between 1640 and 1660, and 19th-century works (created between 1820 and 1850) including some delightful paintings by Fragonard. The works from the later 17th century represent the style called "Parisian Atticism," which was a new style of classical art that became popular in Paris. The museum offers a unique insight into a very original private art collection. In the museum's boutique, visitors can find postcards, souvenirs, and reproductions of art works. The Jardin des Sciences de l'Arquebuse offers an array of natural science attractions. In the 18th-century Pavillon de l'Arquebuse are exhibits on zoology, geology, mineralogy, and entomology. The museum features well-presented interactive and educational display windows to help visitors understand the natural history. The Pavillon du Raines is dedicated to temporary exhibitions on popular subjects, such as environmental issues. The Planetarium will appeal to those who appreciate astronomy; the special "introduction to astronomy" show provides an interesting scientific perspective on the planets, stars, and galaxies. Visitors should also spend time in the Jardin Botanique (Botanical Garden), which features a wonderful presentation of diverse Burgundian flora. This beautiful public garden is a pleasant place to relax in nature. The Chartreuse de Champmol lies at the western edge of Dijon. Once the burial place of the Dukes of the House of Valois, the Chartreuse de Champmol now houses a psychiatric clinic. This intriguing site includes a church door with magnificent sculptures and the "Puits de Moïse" ("Well of Moses") created by Claus Sluter in 1404. Both works are important examples of medieval art, and are the only two surviving pieces of Claus Sluter. The "Puits de Moïse" is a famous attraction in Dijon. This hexagonal well features decorative columns topped by angels and statues depicting the six Old Testament prophets: Moses, Isaiah, Daniel, Zechariah, Jeremiah, and David. The Well of Moses was restored in 2003 using innovative advanced techniques, allowing visitors to appreciate the original splendor of this magnificent sculpture. Another impressive church in Dijon, the Eglise Saint-Michel stands to the east of the Ducal Palace. Founded in 1497 to replace a more primitive church, this striking building features Flamboyant Gothic architecture with three richly decorated doorways. Because the church was constructed slowly, it incorporates Renaissance architectural features that were added later. Constructed in 1614 for Etienne Bouhier, an advisor of the Bourgogne Parliament, the Hôtel de Vogüé is one of the most precious historic buildings in Dijon. The magnificent Hôtel de Vogüé exemplifies grand Renaissance architecture in the classical style. This gracious hôtel particulier has a picturesque courtyard, a lush garden, and majestic entrance porch. The entire building is characterized by its decorative richness, and the tiled roof features the colorful geometric patterns that are typical in Burgundy. Grand Hotel La Cloche Dijon - MGallery Collection: 5-star luxury hotel, beautiful heritage building, contemporary room decor, upscale restaurant, sauna. Hotel Oceania le Jura: mid-range pricing, family rooms, indoor pool, sauna and Jacuzzi, lovely courtyard. Hostellerie du Chapeau Rouge: affordable rates, friendly staff, chic decor, Michelin-starred restaurant, deluxe spa. Hotel Victor Hugo: budget hotel, convenient location, quiet street, comfortable rooms.